The poster for UFC on Fox: Maia vs Condit. UFC on Fox: Maia vs. Condit (also known as UFC on Fox 21) was a mixed martial arts event produced by the Ultimate Fighting Championship held on August 27, 2016, at Rogers Arena in Vancouver, British Columbia, Canada. This was the second time a UFC on Fox event was held outside the United States (the first one was UFC on Fox: Gustafsson vs. Johnson, in Sweden, in January 2015) and the first time in Canada. 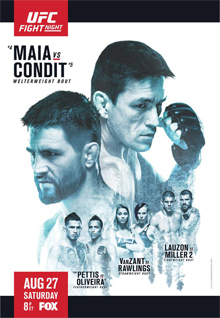 The event was headlined by a welterweight contest between former WEC Welterweight Champion and former interim UFC Welterweight Champion Carlos Condit and former UFC Middleweight Championship challenger Demian Maia. The bout was scheduled to take place at UFC 202, but was moved a week later to headline this event. The Ultimate Fighter: China featherweight winner Ning Guangyou was expected to face Marlon Vera at UFC 202. However, due to an out-of-competition failed test and following investigation concluding Ning ingested the substance without fault or negligence, the bout was moved to this event. In turn, the bout was postponed again due to alleged visa issues for Ning, which restricted the timing of his travel. Josh Emmett was expected to face promotional newcomer Jeremy Kennedy at the event. However, Emmett pulled out of the fight on August 19 with an undisclosed injury. He was replaced by fellow promotional newcomer Alessandro Ricci. The Ultimate Fighter Nations welterweight winner Chad Laprise missed weight, coming in at 159 lbs. As a result, he was fined 20% of his fight purse, which went to his opponent Thibault Gouti. The fight proceeded as scheduled. A middleweight bout between promotional newcomers Adam Hunter and Ryan Janes was canceled after the weigh-ins, due to a potential USADA (U.S. Anti-Doping Agency) violation stemming from a Hunter's pre-fight out-of-competition drug test. According to a UFC official, Janes was reportedly paid his "show" money. ^ a b Staff (2016-08-27). "UFC on FOX 21 draws 10,533 fans for live gate just short of $1 million Canadian". mmajunkie.com. Retrieved 2016-08-27. ^ UFC Press Release (2016-06-15). "UFC returns to Vancouver in August". ufc.com. Retrieved 2016-06-15. ^ Thomas Gerbasi (2016-08-22). "Guangyou-Vera bout off Vancouver card". ufc.com. Retrieved 2016-08-22. ^ Staff (2016-08-19). "Josh Emmett out at UFC on FOX 21; promotion seeks Canadian lightweight replacement". mmajunkie.com. Retrieved 2016-08-19. ^ Jeremy Brand (2016-08-19). "Alex Ricci steps in for Josh Emmett against Jeremy Kennedy at UFC on FOX 21". mmasucka.com. Retrieved 2016-08-19. ^ Staff (2016-08-26). "UFC on FOX 21 weigh-in results: Laprise heavy, but Condit (170.5) and Maia (171) on weight". mmajunkie.com. Retrieved 2016-08-26. ^ Mike Bohn (2016-08-26). "Adam Hunter pulled from UFC on FOX 21 card due to potential USADA violation, fight vs. Janes off". mmajunkie.com. Retrieved 2016-08-27. ^ "UFC on Fox: Maia vs. Condit". Ultimate Fighting Championship. Retrieved 2016-06-15. ^ Staff (2016-08-27). "UFC on FOX 21 bonuses: Paige VanZant's sick kick good for an extra $50,000 check". mmajunkie.com. Retrieved 2016-08-27.